Ontario residents may wish to reference US EIA statistics which provide pricing for industrial and residential categories, by state. NY state, in March, was at 6.74cents/kWh for industrial, and $16.75 for residential (a particularly large spread compared to most states). Ontario seems to be headed to a more extreme differentiation. It is difficult to see how the low-price power of the Niagara river, and the Saint Lawrence, aren't now earmarked only for industry - which may be appropriate, but is the only way the power could not be subsidized at those prices. 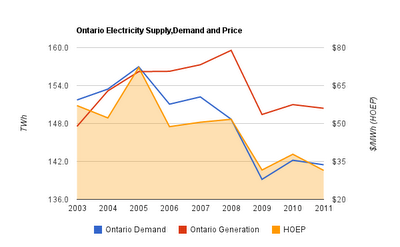 Minister Bentley is incorrect when he states Ontario's excessive generating capacity now is due to "demand following the world-wide recession left us with extra, and we’re putting that extra to work.” Ontario demand peaked in 2005, and Ontario's net exports peaked in 2008 (bottom table here). 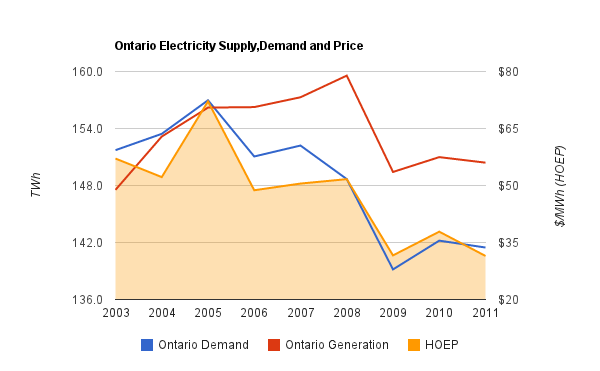 The recession gutted the price - which is when exports became a huge issue which drove up Ontario pricing; the high price of power to industry preceded that problem. Regardless, my conclusion to Demand Destruction: Economic Reality And Ontario's Electricity Policy bears repeating now that the government will more aggressively provide lower rates to industry due to our disproportionate production capacity: "There is no excuse for not investigating spending problems, because there is no good solution in finding some other group to pay." It is important to remember this action is being taken by the same government that only recently acceleration it's procurement schedule for intermittent renewable energy, the bulk of which, wind, is poorly matched to Ontario's demand profile. This is the 4th press release from the Ministry of Energy this month. If the next one doesn't indicate the new rules for the feed-in tariff will protect consumers by limiting payments to FIT generators during surplus production, it will be clear this corporatist government is acting against most of it's constituents.